Even a well-maintained battery can go dead, either through mechanical failure or human error. Carrying booster cables in your trunk is the best way to keep yourself from getting stranded if your battery dies. If you’re in the market for a set of booster cables, we’ve picked out 10 of the best options in the article below. You might be surprised how many different factors there are to consider in getting the right cables for your vehicle. 1) What kind of vehicle are you jumping? A larger SUV or truck might need a more heavy-duty cable than a compact car. You’ll want to look for a cable with a lower gauge and a higher amp rating to reliably jump a bigger engine. 2) How long of a cable do you need? Anything under about 20 feet long will be too short to do front-to-back jumps. Longer isn’t always better, though. More cable means it’s heavier and takes up more space. If you don’t mind nose-to-nose jumps, a shorter cable is easier to store. 3) Does your region have harsh winters? Certain materials can get stiff in cold weather. If a booster cable loses its flexibility, it can become extremely difficult to work with. Avoid this by looking for a cable that’s rated for sub-zero temperatures. These versatile booster cables work on all battery configurations, in both 12-volt and 24-volt sizes. They’re also easy to use and stay flexible in cold weather. Let’s start things off with these 4-gauge, 20-foot cables from Cartman. These booster cables are the perfect length for most cars. They’re long enough you won’t have to strain to make them reach, but not so long they’re unwieldy. These Cartman cables are also quite versatile. They’ll work on both 12-volt and 24-volt batteries, and you can connect the clamps on the top or the side. The coating is designed to stay flexible in all conditions, too. It’s been tested down to as low as -13°F (-25°C). Safety is important in jumper cables, too. These ones feature shielded clamps that protect you and your car from currents and short-circuits. They can get a bit warm if you’re using them for a while, but they’re otherwise a safe, convenient option. These TOPDC booster cables are long and easy to use, but they have a relatively low amp rating. Still, they’re a great low-price choice for smaller vehicles. If you’re looking for a cheaper option for a 20-foot cable, here’s one that will cost you less than twenty bucks. That just might be the lowest per-foot price on the market. You do sacrifice some performance for the lower price. This will give sufficient power for compact cars and smaller vehicles, like motorcycles. With an amp rating of only 200, though, it’s not the best option for larger vehicles. Aside from that, this is a well-made cable. It will work in extremely cold weather without a problem. The clamps are well-made with a strong spring and a vinyl coating to prevent corrosion. They’re a durable and affordable option for compact vehicles. A high-quality jumper cable for any-sized vehicle. This is a great all-around option if you want a mix of performance and value. 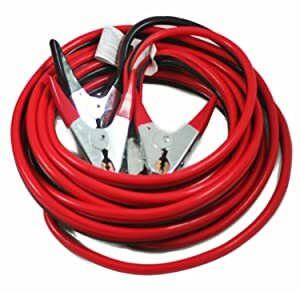 For a heavy-duty, powerful set of car jumper cables, you want a low gauge and a high amp rating. This set from EPAuto fits the bill. They’re durable, well-insulated, and can jump even larger engines with ease. We weren’t especially thrilled by the clamps. They have a secure grip but weren’t all aligned correctly. It’s still workable but does make it tricky to get a good grip. Once attached, though, they held their grip well. The jumper cables itself are the most important part, of course, but the included accessories are a nice touch. Both the work gloves and the carrying case are relatively sturdy. Overall, a durable product at a good value. 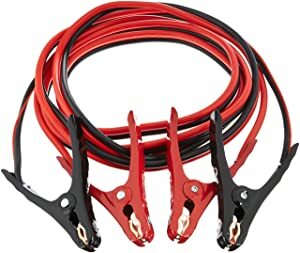 If you’re looking for the most budget-friendly option, these Amazon exclusive jumper cables are the best ones you’ll find for around ten bucks. Just keep in mind they’re only recommended for smaller vehicles, like motorcycles and compact cars. Here’s an Amazon exclusive that brings you a basic set of jumper cables for just over ten bucks. Unsurprisingly, it’s also a relatively high gauge and low amp rating. You won’t want to use this for bigger vehicles, but it’s a cheap option for smaller cars. The clamps are easy to position correctly, although the grip didn’t feel completely secure. The cable itself is easy to work with, both lightweight and flexible. To some extent, you do get what you pay for. These jumper cables aren’t at the same quality as the pricier options on this list. For the budget-conscious consumer, though, they’ll get the job done as long as you have a small car. 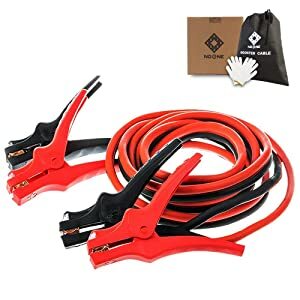 If you have a jump starter pack, you can’t connect it using traditional jumper cables. 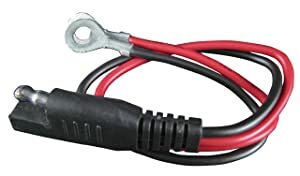 This cable is especially useful for attaching float chargers to motorcycle batteries. Using a second engine isn’t the only way to jump a dead battery. If you have a portable charger, you’ll still need a way to connect it to your engine. This Schumacher cable is an affordable way to hook up one of these devices. This cable uses the same color-coding as traditional jumper cables to make it easier to use. The O-ring design will work with most motorcycle batteries. They’re a bit small for most 12-volt terminals, though. The slender, flexible cables can reach even hidden terminals on smaller batteries. For traditional jump starting, this isn’t the right tool. If you’re by yourself and have a portable charger, though, this wire will hook it to your battery securely. These are durable cables with a weather-proof design. At only 12 feet long, though, they might be too short for some situations. The built-in features on this NoOne are what make it stand out. Every clamp has a built-in LED light so you can use them more easily at night. It also comes with gloves and a bag that helps you store them. At less than a pound, they’re easy to store and carry. The only downside of these jumper cables is that they’re relatively short. You’ll need to pull the cars nose-to-nose to use them. In terms of performance, though, these are high-quality cables. The insulation on the cable keeps them from kinking up or folding, and it also helps them work in cold weather. If you don’t need a super-long cable, these are an affordable choice. 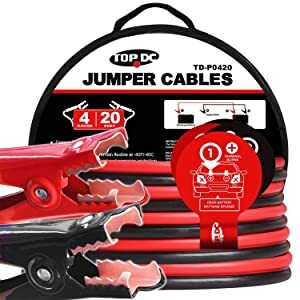 These heavy-duty jumper cables work in all weather conditions. They’re also long enough you can use them from behind the vehicle, making it easier to get a jump. Energizer is a brand you can trust, and their jumper cables hold to the same quality standard as their batteries. 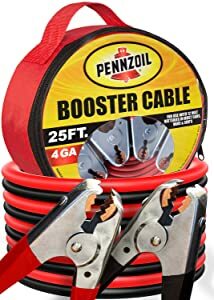 These heavy duty booster cables are some of the best on the market. Not only are they high-quality, they’re built for maximum convenience. 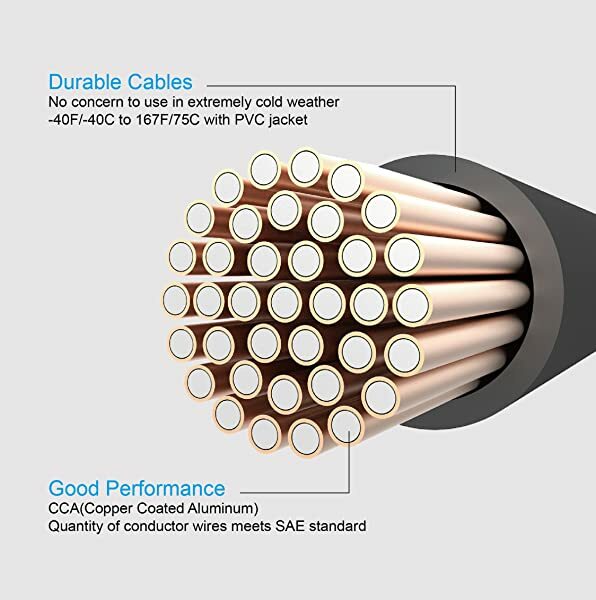 These cables use a copper-clad aluminum that keeps them flexible in any temperature. The cable is insulated with PVC and the clamps are vinyl-coated. These multiple layers of protection mean you can use them in any weather. And they’re durable, too, lasting through hundreds of jumps. The long length of these jumper cables is another big advantage. It means you don’t have to pull the cars nose-to-nose to get a jump. With 25 feet of length, these will let you use them from behind most vehicles. That alone is a big point in their favor. These cables give you a 25-foot length at a very reasonable price. They’re also more portable than most similar-length cables. A lot of 25-foot jumper cables are bulky and heavy. They’re great for a garage but less convenient when you need to take them on the go. These Pennzoil heavy duty battery boosters weigh just over 6 pounds so you can move and use them easily. Not only are they the most portable option at the length, but they’re also very affordable. You’ll get both the cables and case for less than $30. They aren’t the cheapest cables out there, but it’s the best price you’ll find for 25-foot jumper cables. The bag these come with is unfortunately not great. The thin vinyl feels flimsy, especially compared to the heavy-duty design of the cables themselves. Still, the set is an excellent value considering the quality level of the cables themselves. If you have a compact car or small sedan, you might not need a full 25-foot cable to jump parked front-to-back. 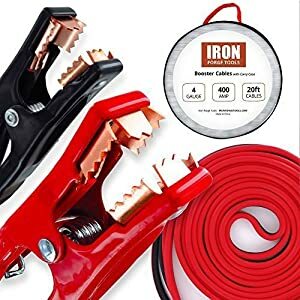 A 20-foot battery jumper cable like this one from Iron Forge Tools will work even if you’re awkwardly parked. These are robust cables that will work well for any standard car, as well as bigger vehicles like trucks and SUVs. They’re also a safe choice since the thick coating keeps them from heating up while you’re using them. We like how securely the clamps fasten to the terminals. The clamps aren’t coated so you’ll want to be careful using them in wet weather. Otherwise, they definitely feel like they’ll stand up to a lot of uses. The 25-foot length and high amp rating make this a great option for larger vehicles. The strong clamps and durable, flexible cable will work reliably in any weather. If you need to jump a large vehicle like an RV or a semi-truck, you need a special set of jumper cables. This battery jumper cable from ABN will work even for these commercial engines. With strong clamps and rugged, durable coatings on the cables, this is a reliable cable for any vehicle. The cables in this set are pure copper. That’s the ideal material for conducting electricity, which is what allows these to work for high-powered engines. They’re also easy to use and store. Most long cables are susceptible to tangling but these cables are designed to resist it. The only downside we found is that they lose some of their flexibility in cold weather. Otherwise, they’re a great option for any car or truck. 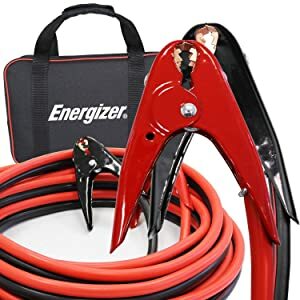 If you’re looking for the hands-down best booster cables out there, you can’t go wrong with the Energizer Jumper Battery Cables. 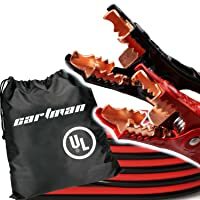 While they do cost a bit more, it’s worth it for the quality boost, especially if you have a larger vehicle. Step 1. Turn off both vehicles. Step 2. Connect the red (positive) cable to the positive post of your dead battery. Step 3. Attach the other red clamp onto the positive post on the functioning battery. Step 4. Connect the black (negative) cable onto the negative post of the functioning battery (the same battery you used in step 3). Step 5. Find a metal part on the frame of the dead car, like a bracket or a nearby bolt. Attach the other black cable to this, not to the negative terminal of the dead battery. Step 6. Start the working car. Step 7. Let the working car run for 1-2 minutes. Then, with the cables still attached, start the dead vehicle, then let it run for a few minutes to give the battery time to charge. Step 8. Remove the clamps from the vehicles in the reverse order of how they were attached. Take the black clamp off of your vehicle’s frame first, then remove the black and red clamps from the working battery. The last clamp you remove should be the red clamp on your battery. 1. Jumper cables or a jump starter: which is better for my car? Using jumper cables won’t damage your engine, but a jump starter is a bit safer. Modern vehicles are more prone to voltage spikes and other potential hazards. If one of these happens during jumping, it can damage both engines. Jumping a car can also potentially cause damage to the functioning vehicle. Cars in good repair shouldn’t have an issue but jumping a car can aggravate existing electronic problems. This could mean you both wind up stranded—something that’s not a concern with a jump starter. 2. Are short jumper cables or long jumper cables more convenient? That depends on what you mean by convenient. Longer jumper cables are more versatile during use. They allow you to jump your battery even if you can’t get a car alongside it. Shorter jumper cables, on the other hand, are more convenient to store. They’re lighter and take up less space in your trunk, which is helpful for more compact cars. 3. What does the gauge on jumper cables mean? The gauge is a measure of the thickness of the cable. A lower gauge indicates a thicker cable, which will be more effective at jumping your vehicle. A gauge of 8 will start most vehicles. If you have a bigger battery, you may need a gauge of 6 or lower.